This is an incredibly powerful piece of software that completely changed the dynamics of our website. On the fly galleries and multiple sourced RSS image and social networking feeds have given our clients exactly what they need from our website. Customer service is top shelf. Firsh quickly responded to our issues and made sure we were on the right path. Five star service, five star product. Justified Image Grid allowed us to create galleries for my website in a way that not only matched what I was looking for, but exceeded my expectations! With all of the options packed inside, we were able to easily create multiple gallery styles for many different pages that were styled to the exact way that I wanted them to be. As always, absolutely fantastic work. This is THE BEST photo gallery plugin available! For any potential customers: We use Justified Image Grid on every single site that we manage and have literally nothing but absolutely beautiful, user friendly and perfectly customizable results that fit our every imaginable need. I haven't met a single person who doesn't love the way the galleries display our model portfolios and photo sets. Literally anyone who needs to create a gallery of images for any purpose at all can use JIG and have it meet every single need that they could possibly have. It's beautiful, insanely customizable and just works giving our users exactly the kind of experience they would expect from a high-end website. Not only is this plugin fantastic in so many ways, but Firsh gives absolutely amazing and fast support for every question you can think of. If I could give this 6-stars I would. This gallery plugin is the best I've ever seen. So flexible, so elegant, great documentation, works very well. Perfect. I am a wedding photographer that is interested in having full control of how my users view my website. It was very important for me to have a quick loading gallery that also opened the images quickly in full screen to showcase the quality of the work. I think hands down the JIG thumbnails + Photoswipe is the best way to showcase photography on WordPress. The fact that it easily integrates with real media gallery is the icing on top making WordPress feel like an actual full photography website. I have been running some tests and Google definitely likes the way that JIG is serving up my image thumbnails with alt tags and descriptions. It even links to the high resolution version, so it's a win for search engines and my users! 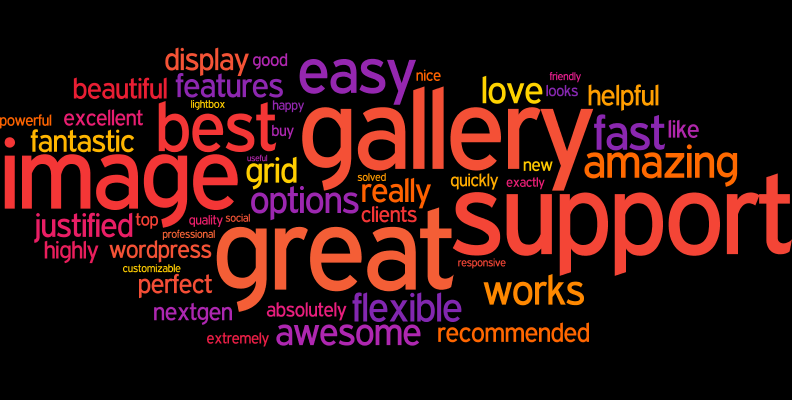 I have been recommending it as “the best WordPress gallery” to all of the Facebook groups I am part of! Justified Image Grid is a great way of formatting and customizing my images in a clean and professional manner. It’s versatility makes it an invaluable part of my layout and workflow, and whenever there are any questions or problems, the author responds in a very helpful and timely manner. Powerful plugin. So many options, uses, customizations can be confusing but superior customer support every step of the way. Super responsive and patient. Wish everyone was this understanding to novice web developers! Thank you. Searched many days and hours for a plugin like this. Everyone talks a mean game about NextGen, but IMHO, this plugin has it beat. It's much, much faster and has less of an impact on my site in terms of load time than many other plugins. Great plugin works nicely with Flickr, NextGen Gallery and others. Easy to use as well and regular updates and upgrades. This plugin saved my life for getting videos from an RSS feed for a client. It is really easy to use, very customizable and support was amazing. They personally helped me get through a few trouble spots. I highly recommend this plugin. Firsh, you said you would create Retina-ready functionality outside of Photon. And you did! Thank you! This is seriously awesome. Hassle-free and a dream to use. Congratulations on making this a truly solid plugin. Brilliant. This is just an amazing plugin. I hope you’re around for a long, long time. Your plugin is so utterly configurable I often try hacking before realizing you already covered it. I found your setting in the lightbox settings for loading the custom box on mobile or not. Great work. After trying many plugins, JIG was the only one that gave me the control & reliability that I wanted, thanks for the great work! I have a customer with an old site and hundreds of images in Nextgen galleries. Needed desperately to modernize, and I was considering using my own plugin for photoswipe with masonry grid (not public), but that would have meant re-uploading hundreds of images and reconstructing galleries... JIG's ability to override Nextgen means we don't have to move anything, my client can keep using the Nextgen interface she is accustomed to, and we get a gorgeous and modern display. All in a few clicks and $29. So worth it. I cannot thank you enough! There is no better image gallery for WordPress and new features are added constantly. Thanks! I’ve said this before but I’ll say it again. This is one of best gallery plugins out there. Easy to install and use and looks fantastic. With it’s easy social media integration this proved to be the best solution for clients who were more comfortable uploading images onto their social media accounts than entering the WP Admin which can be daunting for some. 5* all the way. Highly recommended! The author of JIG does an excellent job with this plugin. The support is great, detailed and always out there to bring a solution to the problem. Keep up the great work. I love the layout and function of this plugin! Does a great job in showcasing my portfolio items. Had a glitch in getting it to work with my unique configuration and Firsh was right on top of it with fast communication and a successful fix for my problem. Great product with excellent customer service! Firsh! You are the man! I've never gotten a response back from a CodeCanyon developer saying, OK, I remember you and your situation, here's a fix. You're very organized and dedicated to creating a better product with every update. You absolutely deserve all of your incredible success!! Firsh has been extremely professional and unrelenting in his willingness to help with the tiniest detail. I only wish I could rate for multiple reasons. The product is amazing, especially with its ability to function with WP RML folder options. This is huge. Once you get past a small learning curve, it is so easy to not only create a gallery, but to change or update images in a gallery. It makes it so simple that I can pass the know-how onto my customer so they can easily update their own galleries just by adding or subtracting images in the media library. The plugin is extremely flexible and powerful, and the author has been an amazing helper in troubleshooting my issues. Thanks! I initially thought I had a very niche need and would have to make my own plugin. Nope. Justified is better than I could ever make. Its awesome!! A lot of features included, and Firsh is always available to help out, when/if something goes wrong (most of time because of my coding or template update ^^). I can only recommend this plugin to everybody who is in need of a professional solution to improve the user visual experience! Thank you, Firsh! An outstanding plugin. Its options may look overwhelming at first, but it is actually dead simple and very logical. Plus, the author provides great support. Use it conjunction with the Real Media Library Plugin and you can do with images whatever you can think of. JIG and developer, Firsh is GREAT! JIG has given me the tools to take my website to a more beautiful work of art that we are truly proud of. Any challenges to get a gallery to work the way I wanted, was quickly and easily resolved by Firsh. I love him!!! So responsive and not challenge is beyond him. I happy to 5-star this plugin and developer. Ok ... I do not often give ratings but Firsh fully deserves a five-star rating! I purchased JIG after some great pre-sales answers (really thinking with me for workflow). And for the little issues I had, I was provided with really fast feedback: resolving my issues right away (which were ... ahum .. my own fault of course). Many thanks and keep up this excellent work! To anyone considering using Justified Image Grid, this plugin is beautiful and very easy to work with. It gives that extra step of class to a website that makes it stand out above any other. Even the support is an extra step above any other. I had a jQuery problem that I struggled with when I installed and wanted to setup the plugin I mailed Firsh and the same day he fixed it for me. At a later point I realized that there was still a jQuery problem with my dropdown menus and I mailed Firsh again about it and in 2 ticks he had sorted out the problem. It was a conflict between my theme and the plugin. I am using a Theme Punch theme and he even contacted the theme punch guys to let them know of the problem. Thank you Firsh for your wonderful plugin and great support. Customizablility, customer support, design quality, flexibility, feature availability, documentation quality - full marks on all of these. A great plugin in every respect. Code quality and bugs I cannot rate - I don't understand enough about coding. But everything has always worked, without fail. A rating in itself. Justified Image Grid is a joy to work with and to look at! Thank you for making and maintaining it! Awesome plugin, difficult to understand how to configure it at first but once you get it you can do so many things with this plugin. Great support too. If you need to publish photos on your site this is the plugin you need. Easy to use, beautiful design, fast. Using it with Nextgen gallery and PhotoSwipe (stunning lightbox - both in looks and functions!) - it's simply a fantastic plugin, thought-through in every detail! They don't come as reliable as Justified Image Grid. Really, this is the most reliable plugin I have ever used and I'm a WordPress web developer. Great support and a great quality product. I love this plugin! I've been using it for a while, it offers endless options, it's fun to play and test new looks, and the end result is always effective and very reliable. Well worth a small investment. dear Firsh… in the life rarely, we found person like you. really thank you, you are amazing person, other author will tell me this is the plugin i will not solve your issue, but you do not leave your client, thank you again… i will never forget your mails and the support you give. I just showed it to my client and she is SO excited! I have used this with several client sites now but when Firsh was able to show me how to globally add a © caption over all my client's illustrations that was fantastic! I love that it is being updated and that he keeps improving it. There is SO much you can do with this plugin, I feel I am always discovering something new. This is the best gallery plugin for wordpress. Great styles, loads of options, and totally flexible. I love it! Works perfectly for what I was trying to accomplish. Thank you so much! Did everything I wanted out of the box to create a truly unique and beautiful grid gallery. Easy to use and fast responses to my presales questions. Our company, along with many other companies we work with, all have become dependent on JIG. AMAZING product - some many features and they all work flawlessly. I've never had an issue. Whenever I've talked to Firsh he is quick at getting back and fixes the issue (every time it has been a user error). It takes a while to learn the product but it's so worth it!! I must have tried at least twenty gallery/portfolio plug-ins before I found Justified Image Grid, and I'd pretty much given up on finding one that would do the things I wanted it to—none of which seemed complicated to me—but when I did one last search I found JIG. I posted a question or two before purchasing and got a response that SAME DAY—some of the people I messaged with questions NEVER answered, and the ones who did generally took days to do so. I purchased JIG and asked more questions about customization, every time getting answers quickly. I cannot BEGIN to tell you how happy I am with this plug-in and its creator. I wish he made ALL of the plug-ins I have to use, because his customer service is the best I've gotten by FAR, on any plug-in I've purchased, and this plug-in is by FAR the easiest to use and customize. This product does amazing things and it looks great, but the thing that really impressed me was getting a considerate and friendly reply from the author within a few hours. Even more impressive, there's a good chance the issue was unrelated to the plug-in, but he still took the time to do some debugging and advise me on a workaround. Developers willing to truly support their code tend to write clean code, and the functionality is definitely there. My photographer client LOVES the plug-in, and I will definitely recommend it to other clients in the future. Firsh, you’re the best. The product is excellent but it’s your level of service that really sets you apart. Thanks for all you do for our community! I have bought and tried a few gallery plugins. They have all been either too complicated to use, you can't make a gallery that looks good without it being overdone or the end gallery just looks like rubbish. JIG plugin is quite simple to use and the finished galleries are good looking. Support is good and very pleasant. As the plugins development continues it will go from a good plugin to the one of choice. I am happy to pay the money for it. There's nothing that comes close to this plugin for galleries as far as I am concerned. The features for Posts/WooCommerce Product galleries are especially fantastic and useful. The customer support has always been fantastic as well. Perfect, looks great - works great, and very easy for the end client to manage galleries in a standard WordPress way. Couldn't ask more from a plugin. Thanks for the lightning fast support. Firsh was great help. He answered my query in under an hour and fixed my issue right away..
Firsh provides top rate support and worked with me to address an issue with the plugin. Highly recommend you check out this plugin! The best gallery solution I have ever seen and used. Amazing possibilities and excellent support. I'm using JIG as a Grid much more than as a gallery. Reason? I found performance to be really zippy and customisable options incredibly thought-through and versatile. I guess with so much options it's bound to have a few option forks that may not be applicable under certain conditions. JIG is incredibly powerful as I could mix styling results with my custom queries to leverage on its render engine for showing my custom Grids. I guess having action/hooks would streamline the job further and I hope you'll be able include that as a feature in future too. Just to add, due to it’s insane versatility (without the usual plugin bloat), I found JIG to be perfect for rendering an extremely wide range of visual content. When combined with custom queries, everything just made sense. Got fast and professional support from Firsh when we faced some difficulties in our webpage. Even solved 3rd party issues successfully and fast. Way to go. I was happy to find this plugin, which makes it easier for my clients to add photos to their site - directly from flickr. The process was fairly simple, and when I moved the site to the live host and had some linking issues, I got great, fast support and everything looks good. Thanks! Awesome plugin with tonnes of options for customization. Fast and friendly responses from the author! Researched a lot of gallery plugins before settling on this one. Stoked! This plugin is awesome, but Firsh’s customer service is incredible! I liked this so much I bought two :) This really is a great plugin and the support is second to none. Trying to find a plugin that would show my pictures the way I wanted them shown was AMAZINGLY hard... Justified Image Grid was EXACTLY what I needed... It shows my images precisely how I want them to be shown, and is SUPER easy to use. LOVE this product!!! I am amazed at how your answers to every issue I’ve encountered have resulted in an eye-opening revelation of the power of your plug-in and the power that you’ve put into the hands of those using it. I may be a little slow in thoroughly grasping how each component works, but the more I learn about JIG, the more impressed I am at the forethought you’ve put into creating a tool that is both powerful and flexible at the same time. I love how your settings externalize controls of virtually all functions, and how your presets allow snapshots of the settings, and how your blue/orange/gray authority status PER SETTING allows control over who is boss: preset or settings. And then if we still don’t like every single setting in the combination of preset and general settings, we have shortcodes that can give that final tweak for one-off exceptions. Brilliant use of table-driven software functionality! Let me just say this plugin is the best thing that ever happened to WordPress galleries, thank you! Had an issue with our site loading the JIG gallery. I received a prompt response and told that an update would be made to the plugin. In the meantime, I was given the file that would fix the issue. Worked great! First off this plugin is fabulous. Amazing at what it can do. This is without a doubt one of the most powerful plugins available. It gives you so many options it will take you hours to understand them all. Use it for Ads: I implemented it as a new way to serve up ads for my clients, and they LOVE IT. It’s clean and it’s fast, it truly is a fantastic plugin. Spectacular plugin for displaying photos on your site. We upload to Flickr (which is easy for end-users) then use JIG to display on our site. This is one amazing plugin. I've purchased and used this plugin on several sites. I had some hosting configuration problems that the developer was able to identify and helped me a great deal and very quickly. No hesitation in buying this again. I won't talk about how great and versatile the JIG plugin is because that seems well established by many other users. What most don't speak of is the support from Firsh, the developer. When I have needed some help or had some basic questions Firsh has always responded. More so, he gave complete and accurate answers every time. This guy really knows his stuff! You can buy this plugin in complete confidence that you will get support if you need it. I had to choose one... Customizability! Wow, this does everything. Support is the best I have ever, ever encountered on the web. Honestly. The developer is fantastic. You have made my website so flexible with this plugin being able to use Flickr for fast sharp images in my photography without having to upload to WordPress which is a horrible, horrible affair. Love this plugin. I've used it for years because it's so solid. Loving the frequent updates and the endless choices available in the options. This is a very powerful plugin and Firsh really stands behind his work with excellent technical support. Absolutely fantastic! It had every feature I was looking for, especially easy interface with infinite scrolling and random photos. Highly recommended! Really does a nice job of displaying gallery images. My clients love it! Really impressed by Justified Image Grid. It's highly configurable so there's a good chance you'll be able to get it to do just what you want it to. Of course, with that amount of flexibility does come a learning curve and Justified Image Grid can be quite daunting. The good news is that the documentation is excellent. I had some problems getting it to work in conjunction with a text widget. Firsh was amazingly helpful and went to great lengths to come up with a solution. So I'd say the support is first class. Highly recommended! Justified Image Grid, just the best for gallery... and very efficient support. Thank you very much Firsh, it’s perfect ! Thank you very much Firsh. I’m completely happy now. You are amazing. The Ajax support is great. I was no longer using the plugin. Congratulations and continue this evolution. Now I give you 5 stars. Well deserved. I love you. The plugin is very good! Just a quick note to say that I really love this plugin—not just how it looks (and works) but also the fantastic shortcode generator and the comprehensive user guide. Well worth the investment. Thanks so much! Amazing plugin. Awesome support. The most feature rich plugin I've ever used, for sure! This plugin is pure gold. Thank you for creating this. It solved so many of my problems. And including PhotoSwipe was what really made me find this plugin in the first place. The flexibility is amazing. You've made me a very happy photographer/geek. This is hands down the best wordpress plugin I have ever experienced. There isn't a single element that's not customizable - and if there is any challenge whatsoever, from implementation issues to minor styling gimmicks, the developer always responds with a great solution within 24h. Truly amazing product and best customer support ever! I love this gallery plugin… Been hoping someone would put it together, and did not imagine it being this good. Bravo! Awesome plugin, plus when I have needed help I've gotten help very quickly. This is simply unbelievable!! Streets ahead of anything else like it…. I cannot recommend it highly enough – I’m just speechless. The effects are beautiful, simple to set up and oh so powerful. You my friend have been awesome! You went beyond the call of duty to help me out! So easy to recommend your work and support to others! We need people like you out there on all Envato Marketplaces! There are certain people that you never meet and end up having a mere professional relationship or say they remain as distant acquaintances. You fall well out of that category mate. There is something about your spirit that comes across in a rather warm, welcoming and genuine manner. Very good plugin with lots of customizations possible! The support is great, the documentation is good! When you start to learn how the plugin is working, the fun starts to get it working as you need! I use this plugin with WP Real Media Library, a very good combo. The best feature of JIG is without doubt the personal support of Firsh, the software author. I have been using NextGen WP plug-in for a number of years but its support for the display of images is very lacklustre. With JIG installed for testing my site was quickly and easily given a fresh coat of paint, the image display options and flexibility of the JIG options allows images to displayed in a large number of ways so there will be an option to suit everyone. If JIG doesn't have a feature you need then talk to the author, he is always open to suggestions. Currently my site has over 6,000 images and NextGen and JIG perform flawlessly together and has been used to develop the speed and performance of the plug-in. Awesome plugin for WordPress to display pictures, does it all, beautiful layout, support is a 5 stars rating. Just want to say: what an awesome plugin. I have been looking for a gallery for wordpress with these capabilities for an age! Great work Firsh. Update installed, and working no bother. New features implemented perfectly! Including my social capabilities request. Great service also, with prompt replies to some initial teething problems that were immediately resolved, and the gallery is now up and running! Keep up the good work. Great plugin and a great author!! Easy install, and when I had a small issue the author took care of it within minutes. Perfect and easy! Best (responsive) gallery plugin by far! Great job. Top rated image gallery for both beginners and advanced developers. Looks very well, behaves very well, integrates with everything, has tons of options and a ton more. Wanna see it in action? Check lightorialist.com All in all I have to Thank You! The best gallery plugin I've used, and I've used all the expensive ones like Envira and NexGen Pro. This is my favorite by far. Implemented API such as for Flickr is simply amazing. No need to maintain two media contents. I’ve tried pretty much every single WordPress gallery available on CodeCanyon and Justified Image Grid is head and shoulders above the rest. Great product, great support. Highly recommended. Unless you have a text-only website with no images whatsoever, this should be the first plugin you install. Wow, this plugin saved a 13 year old photo gallery that was really unusable with native NextGen Gallery or NextGen Gallery Pro all without having to replace the repository or import anything. Bravo! NextGen can handle the backend, but Justified Image Grid owns the front end. Flexibility for sure but I need to add Customer support. Firsh is exactly how you wish a developer would be. He's kind, supportive and most of all he has the knowledge to answer the weirdest questions. This is fun and easy to use. Works as advertised. Some plugins are dropped at your doorway and left there. Not Justified Image Grid; support here is excellent. Firsh will do the impossible to keep his client happy and make sure his plugin does what he told you it would do. This is one darn good plugin best out there in regards to working image galleries. And the support is amazing. This is no ghost review check my site wildatpalmas.com and check my nature photography galleries those are JIGs. I wish I could choose all of the categories for this rating. Great product, but just as fantastic is the support. This product is flexible, beautiful and it does more than what you might expect. You need a gorgeous grid? Don't hesitate. This is exactly what I've been looking for... A script/plugin that has perfectly fused Social sharing, deep linking of images (for SEO) & a lightweight/clean lightbox that works great on Mobile & desktop. But I purchased it because it does WAYYYY More that the 3 simple things I was looking for. One of the biggest surprises I had was the social sharing feature. It works perfectly! I had a client share a single image from a gallery to their Facebook. The format was clean & simple. But the results were amazing. When a Facebook user clicks to view the image, it takes them to my website where the gallery is & opens the lightbox to display the exact image that was shared. My website traffic spiked over the next 24 hours as my clients Facebook friends clicked to view the image. They spent an average of 2 minutes on my site & visited an average of 7 other pages before returning to Facebook. I'd term this method of social sharing a huge WIN! This is by far the most versatile & easy to use plugin. They also make great recommendations of other free & premium plugins to enhance the usability of WP Media Library. Bravo! You've done a fantastic job on this plugin. I'm sure this will become my go to script for galleries & portfolios to display images, videos, & custom posts. My background: I've used dozens & dozens of gallery & lightbox scripts & plugins. I'm a programmer, so I've coded scripts into plugins & themes to get the functionality I wanted. But I've always been left looking for new scripts, because the next project needs something a little different. After purchasing this plugin I had a few beginner problems. I wrote to Firsh and got a really competent solution after just 10 minutes - wow. In the meantime I tried a lot - the Justified Image Grid is awesome and stunning. From my point of view after many experiences with galleries JIG is the best gallery for my needs. The great documentation and the excellent customer support are additional points. Firsh, you are really a gem in the WordPress community. Firsh spent several weeks (including holiday season) with my problem. His efforts were truly above and beyond what I have come to expect for software support. He PATIENTLY! stuck with me, though my lack of web expertise would have tried any other web guru. Of course, I was desperate in resolving issues (I was to blame!...failed to embed sRGB profile into my photos!) because JIG is, by a wide margin, the best photo gallery plugin available for WordPress. The author is on top of his support and responds at speed of light. The plug in is just awsome and very flexible. Most importantly it works, is fast and images look great. By far the best and most comprehensive plug in that I've installed in the process of building my website! I enjoyed using the free SlickrFlickr, but JIG takes things to a whole new level. I'm very impressed so far! Outstanding plugin! After months of struggling with a Premium theme that couldn't do the things I needed out of the box, I was so happy to find this fantastic plugin! Great support, very flexible, lots of options and it just works! Bravo! Finally I found a modern, responsive, nicely designed gallery. A stunning piece of work and so easy to use and adapt. Kudos! JIG has been a must-have plugin for me. An essential complement to NextGen. The author has been excellent about following up whenever I've had a question, keeps his plugin up to date, and has even implemented suggestions to the plugin. I have been using JIG for a while. It's great and I recommend it to all my customers... and they buy it. Why? I am convincing, and it is easy to be so with such a good product: For me it is still the best way to display a bunch of photos and it is so customizable... Support is very good too! Probably the best Modal gallery plugin available, offering every well-known lightbox tool within one plugin. Easy to configure, customize and is very theme friendly. The built-in Social Media options are icing on the cake! Though it doesn't yet have a Virtual Composer add-on, it works well within a VC text block allowing the user to fully customize each instance of a JIG gallery on their site. Just an exceptional plugin, with even more exceptional Customer Service...even on the opposite side of the planet! Thanks for your help Firsh!! Justified Image Grid is the best gallery I ever experienced. The possibilities are huge - i.e. navigation buttons, automatically adding images to galleries by assigning categories or keywords, collecting all featured images of your posts building a cool post overview grid etc. The author Firsh is giving really great support to his customers. He's always answering in a very short time and with an high level of competence. I can highly recommend this excellent plugin. Firsh is a genius! Customer support is excellent. I'm very pleased with product quality and service and the gallery is amazing! Thank you Firsh for your support and your incredible work. It's a great utility to display a large set of images in a grid. It has exactly the flexibility I needed to set it up in a way I like it. It also works perfectly with the FooBox. This way I can easily display all the pictures I wanted. I use JIG to showcase my photography portfolio. There hasn't been a problem, ever. It's totally customizable, and gets properly updated to offer even more customizing possibilities and to keep working perfectly with the latest WordPress releases. The best choice to show off your photography work. I give it a 10! Original: Utilizo JIG para mostrar mi porfolio fotográfico. Nunca me ha dado ningún problema, es totalmente personalizable y se actualiza debidamente para seguir ofreciendo más posibilidades de personalización y poderse integrar en las nuevas versiones de WordPress. La mejor opción para mostrar tu trabajo fotográfico, le doy un 10! By far the best plugin for images. Completely flexible, I used it on several different pages within the same site and you can't tell its all JIG. Great stuff... Thank you! This is a lifesaver when it comes to creating websites that should be updated by the client! No more backend access just to upload 4-5 pictures of a company picnic. I use Flickr as the main hub for galleries and is easier to teach the client how to create albums in an external site like Flickr or Facebook. This plugin is fabulous, it not only looks great on my website but it is also extremely slick in its admin features, you can have different styling per gallery. The management of portrait and landscape pictures is awesome, it has solved a lot of the issues I had on my website. Customer Service received from Firsh, the developer is outstanding. All in all a well thought out and a well supported plugin, congratulations and a big thank you to Firsh. Definitely 5+ Stars! So amazing – what a brilliant plugin. You should be uber-proud to have created the absolute best image gallery plugin available. I’m thrilled to apply your Justified Image Grid brilliance to my new site and spread your original aspect ratio based image grid genius across the web. You’ve contributed true beauty to the web. Cheers to you, Firsh. Probably the most robust image gallery plugin out there. I particularly love this plugin for it's ease of use, but the ability to customize nearly every aspect of this plugin makes it the best out there. You have numerous options of lightboxes to use, and can even link thumbnails to product pages or custom post types. Support is also top notch, I highly recommend JIG! I love this plugin. I now have 8 or 9 clients that I have sent to CodeCanyon to purchase this. I then configure and EVERYBODY loves it. The docs are pretty decent and the interface is not difficult at all but that does not mean that a sense of design is not required. With some good design sense and some css abilities there is not much this plugin can't do. Kudos to Firsh! THANK YOU! I have even used it as an initial interface from a home pages and the client is super happy. Rock on with the plug Firsh! This is an amazing plugin. Made my nextgen galleries (1900 images in 30 galleries + tags etc) display beautifully and error free. Took some time to tinker with the options but I did not have to hire a developer. This plugin is without competition. Very great feature settings and great support! Awesome! Love this plugin. I use it on a client website for an art gallery. Using it in conjunction with NextGen Gallery in this instance. It allows us to display the art in each section in nice alignment without gaps. Use it in conjunction with FooBox so that all images on the site have nice lightbox effects. 2 things I was especially looking for: a way to display the images in a gallery randomly (to be fair to each artist) without gaps or strange alignment, AND to handle VERTICAL/portrait orientated images as well. Many plugins only seem to handle long horizontal images. The plugin has lots of well-thought-out USEFUL features. It looks beautiful, too, sophisticated, and FAST. The imagery, description and demos are extremely informative with visuals to understand the features. Not just tech-speak like so many descriptions. I will certainly be buying this for use on other sites, too. Thank you for a great job! The Justified Image Grid plugin for WordPress installed easily, and works fantastic. It's simple to use, and the multiple appearances made customization a breeze. I'd recommend this for anyone who wants their image galleries to stand out. In all - a great plugin. Wow, I think this plugin has the best support of any plugin I've ever used! Not to mention that the posts themselves look absolutely awesome using it. I've wasted too many hours tweaking WP post or gallery outputs into something slick, stylish and responsive. And pulled out too much hair trying to battle against the various implementations of Masonry, lightboxes and the like. Justified Image Grid just works as you'd expect it to, and the customisation options mean you can pull it into pretty much any shape you like without breaking a sweat. Combine this with the range of source options available (including post content, which is a genius addition), and the excellent customer support (Firsh is extremely generous with his time), and you've got a plugin worth every penny. We have a lot of albums (why not when Flickr gives you 1TB !!!) and we have been searching for the last few years for a decent WordPress gallery or Flickr integration to display them. Because we are on VPS we have limited storage but otherwise good specs. Yours is by far the best (and easiest) one we have found so far that also allows us a lot of flexibility with source files. It has already replaced more than 170 individual pages on the site with just the 10 parent pages where we can now display the links to the underlying galleries without having to have a page for each individual gallery. We are very pleased with the functionality. We also purchased FooBox lightbox as that seems to fit our needs very well too. Over the last few years we have used Gallery2, Coppermine and Phoca gallery when the site was on Joomla, and then we used NextGen gallery when we switched to WordPress. We've been using the 'Awesome Flickr Gallery' since NG was bought out and have always viewed it as a temporary solution. Yours does everything we want (so far) and we are very happy with it. Thanks for all the hard work buddy, this is the best deal on CC! Top Notch service indeed! Once again the attention to detail blows me away! This thing even works in bbPress (no custom theme installed). Awesome update Firsh, I love the new center and creative captions. The plug in works excellent with Udesign theme. Great to see all the sales so far, I love this thing. I hope someday you make a WP theme. Best investment EVER! Its the gift that keeps on giving! Right on man, best 12 bux I EVER spent. Don't know how anyone could live without this plug in, looking forward to grabbing FooBox for some added effects!! This is the BEST plug in ever made for WP, and all these bonus upgrades are amazing!!! Everything about this plugin is absolutely first rate; the information and sample galleries on the author's own site, the customisability, documentation and back-up support. The more you explore its potential, the better it gets. You can tell Firsh is proud of his creation and he has every right to be so. Fantastic. It was a coincidence that the upgrade to JIG happened at the same time my site was hacked but Firsh helped me until my site was working again. A++ customer service! Only about third of all ratings have comments. Approximately half of which is shown here. The product receives exceedingly rare 1/2/3-star ratings, most of which are without comments. Those that are explained are almost never constructive. The average is very high, 4.8 stars. Over 95% of the customers are satisfied with the product. These unbiased reviews were provided by actual consumers voluntarily without any monetary incentive. Free copies of the product or others payments were not offered in exchange for a review. Any alteration in the text of the review that does not fairly reflect its substance would be a violation of the standards because it would distort the endorser's opinion. Thus, no substantial changes occurred other than some spelling mistakes and joining multiple lines from the same person. The reviews are in compliance with the Federal Trade Commission guidelines.